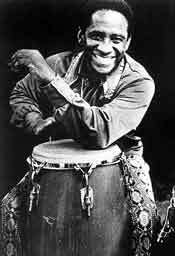 "Afro Blue: The Picante Collection"
"Mongo's Way And Up From The Roots"
Mongo Santamaria, an internationally renown percussionist, died on February 1st 2003 at a hospital in Miami. The Cuban-born bandleader was eighty-five.Santamaria's propulsive skill as a conguero was a trademark of more than four decades of recording and performing, and punctuates his classic 1963 cover of Herbie Hancock's "Watermelon Man," an unlikely, pre-Beatles hit in 1963 that hit Number Ten on the pop charts. 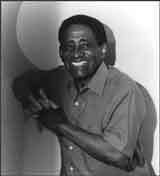 Santamaria may be better known in improvisational circles as the writer of "Afro Blue," a beautiful, melodic composition that worked its way into the repertoire of jazz mainstays from Dizzy Gillespie to John Coltrane. The latter took a particular shine to the song, using it as a touchstone for his developing sound: From early, faithful and pretty interpretations circa 1963 to a 1966 free jazz deconstruction in Japan. 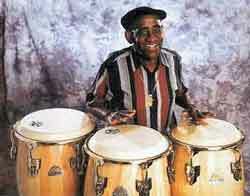 Ramon Santamaria was born in Havana on April 7, 1922. His professional start came in the city's legendary Tropicana Club in his twenties, before moving to New York in 1950. 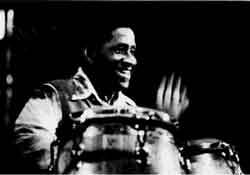 There Santamaria learned to swim in the deep end of the pool, first performing with legendary Cuban bandleader and King of the Mambo Perez Prado, followed by stints with fellow percussionist Tito Puente and vibraphonist Cal Tjader. Fusing the Latin rhythms that were practically his birthright with Americanized styles like R&B and jazz, Santamaria made his first recordings as a bandleader in the late Fifties with Yambu and Mongo. With the cover of "Watermelon Man," Santamaria found himself garnering the acclaim of his former mentors. He would even visit the pop charts once again - a feat that, among his mentors, only Prado ever accomplished - in 1969 with "Cloud Nine." And he recorded prolifically through the Sixties, Seventies and Eighties, before slowing things down last decade. But with the success of 1996's Buena Vista Social Club album, more eyes turned to the music of Cuba. Santamaria's music drew attention four decades after its start, with the release of several compilations, including Rhino's career-spanning, two-CD Skin on Skin: The Mongo Santamaria Anthology and Legacy's The Best of Mongo Santamaria, which put a light on his late-Sixties output. "I have two sons, one's named Mongo and the other is Tito," Grammy-winning Latin percussionist Pancho Sanchez told Rolling Stone in 2001. "You know how much you respect a man if you name your son after him. Everything I do and have done can be traced back to those two men. They're my heroes."